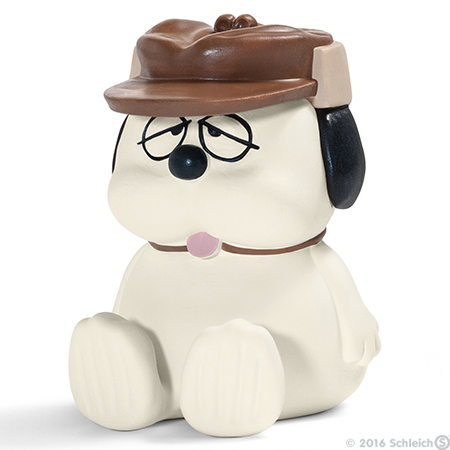 Olaf (Snoopy's Brother) Peanuts figurine is about 2 inches tall (5cm), made of PVC plastic and is made by Schleich in 2016. This item is brand new, never used or played with. This figurine comes loose without any packaging but with Schleich tag. Olaf is Snoopy's brother. He supposedly won the ugliest dog contest. Olaf does not find this at all funny. Snoopy is not the only one of his kind. He has quite a few siblings. Olaf is one of his brothers. He is the one who everyone says is particularly ugly. He supposedly even won the ugliest dog contest. Olaf finds it difficult to see the funny side of this, even though he has a really biting sense of humour. You normally see him together with Andy, another brother. Somehow, the two are always searching for Spike's house. Let's see if they will ever find it.